The Council of Canadians is saddened to learn of the passing of Joan Teghtmeyer, pictured above (left) with Mel Teghtmeyer (far right) accepting the Ken Wardroper's Founders Award from Gordon Laxer (centre) for their committment to social justice and grassroots activism at the Council of Canadians' Annual General Meeting in 2008. Read more. Chapter activists continue to be busy protecting water and public health care, challenging unfair trade deals, calling for urgent and immediate action on climate change, and to standing up for democracy. Below are just a few examples of their recent actions. 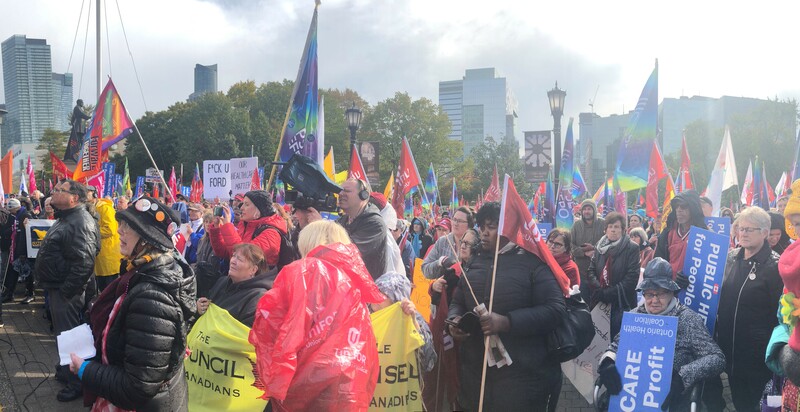 If you are interested in joining a Council of Canadians chapter near you, please check out our Chapter Contacts, call us toll-free at 1-800-387-7177, or email chapters@canadians.org. We can also help you start a chapter if there isn’t one in your community.